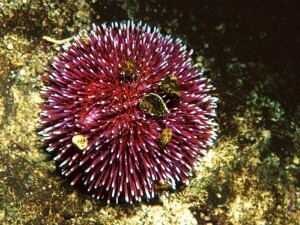 The violet sea urchin is a sea urchin flattened in the centre. It is dark purple with porous whitish fields; the needles are almost always violet with white points. Its shell is a maximum 15 cm in diameter. It feeds on algae and occasionally sessile or very slow animals, and also on carcasses, therefore it is an omnivorous species. Its reproduction is oviparous and there is always separation between sexes, both the sperm and the ovules being laid freely in the water. There are not many cases of sexual dimorphism, that is, there is no external difference between males and females. 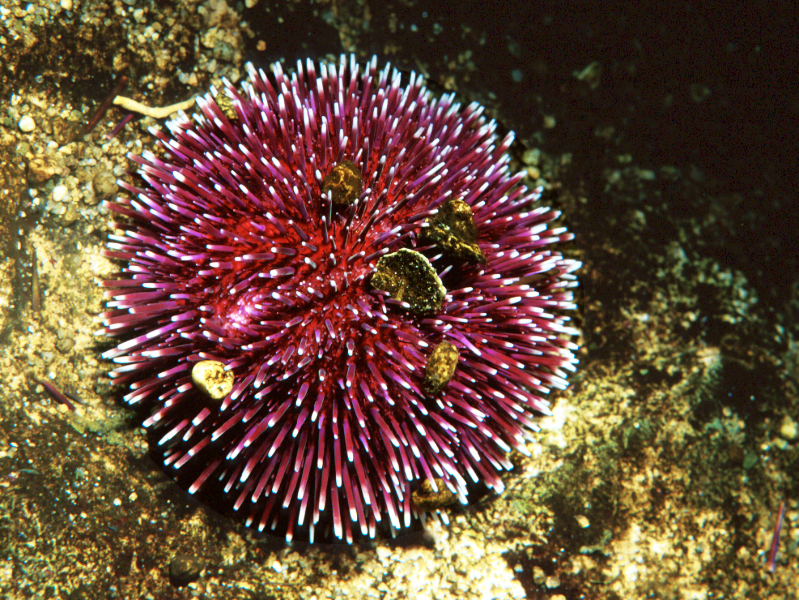 They live preferably on sandy beds with or without marine grass, or on coral, rocky beds at depths of 1 to 20 m.
They are found in the Mediterranean, the eastern Atlantic from the English Channel to the gulf of Guinea and the Azores. Among their needles, they have some that have turned into a kind of clamp, part of which have poisonous glands that serve as a defence against enemies. Do you know why they have remains of molluscs and other invertebrates on their needles? They do this to protect themselves from the light, which they flee from.